I noticed all my school mates have aged, they have retired and seldom have the drive to move. They look serious all the time and I hardly saw them laughed. I remembered when we were young, we were all playful and we always made fun of each other. Whatever nonsenses and jokes we created, we didn't get offended but rather we were enjoying every moment of those time together. Today! Oh my God! The slightest jokes threw on them, they would easily get irritated and offended. I avoided talking unnecessary topics to avoid misunderstanding and quarrels. I think the main factor why most people aged, when they looked old and haggard is... They have forgotten the child like playfulness in them. All children are born innocent, they tend to be playful and naughty as a child. 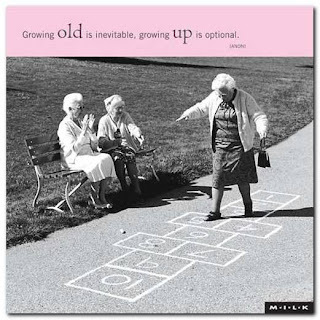 However as we grow to be an adult, we listen to the old folks... Their advices are, please behave and no naughtiness. By the time when they reached middle age, their character was strict and serious. Finally when they attained their sixties, they lost all the humour and laughter in them. What about me? I have the mind of the old but my heart is as young as a child. I could see the depth of life and still have the playfulness of a kid. Some might think I'm naughty but I think I still have not detached my childhood playfulness in me. The combination of old and young, make my present life even more interesting and fun. Am I getting old? No way! My life just started today. For those who wish to join my club, so called as "Forever Young", please feel free to subscribe. The charges are FfL ( Free for Life). My belief - "Growing old is mandatory growing up is optional." I think other web site proprietors should take this site as an model, very clean and great user friendly style and design, as well as the content. You're an expert at this stuff! You're so awesome! I don't suppose I've truly read something like that before. So nice to find another person with genuine thoughts on this subject. Really.. thanks for starting this up. This web site is something that is required on the web, someone with a bit of originality! The most beautiful things in the world cannot be seen or touched but can only be felt from the heart. Your comment is certainly beautiful to be felt. Thank you so much.